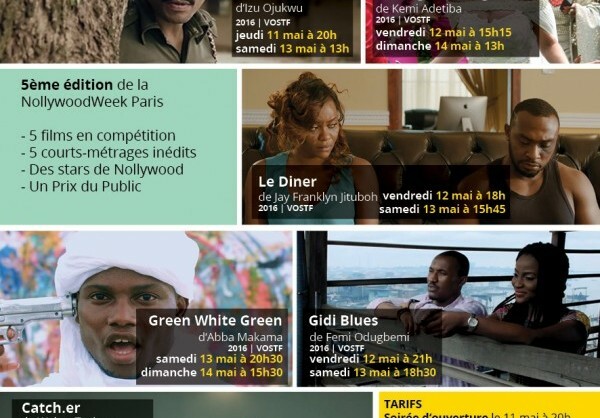 Momentum is gradually gathering ahead of the Nollywood Week Festival, which returns to the cinema L’Arlequin in Paris for its 5th edition from Thursday May 11 to Sunday May 14, 2017. This year’s selection reflects the diversity of genres that now make up this industry. Festival-goers will discover the record-breaking comedy, ‘The Wedding Party’ from Kemi Adetiba, ‘The Diner’, a drama from the director Jay Franklyn Jituboh, and also ‘Catch[dot]er’, a film from the newly styled NollyNoir genre, directed by the British-Nigerian film-maker Walter Taylaur. ‘Catch[dot]er’ will premiere at the closing night of the festival on Sunday, May 14 at 20:30. This year’s competition has 5 movies in the running to win the prestigious People’s Choice Award, sponsored by Angénieux, one of the leading manufacturers of high quality optic cinema lenses for the broadcast and film industries. Angénieux will gracefully put its optics at the disposal of the winner of the People’s Choice Award, giving them a chance to combine their creativity with French technical know-how during their next shoot.